Before examining the data in the tabs, it will be useful to briefly remind some considerations, quite often treated anyway, on the physics of strings (2)(3). Breaking point define the tension at which a string of 1mm in section breaks for modern gut. This is estimated at about (13). At equal vibrating length, gut strings of different diameters will break, theoretically, at the same frequency (breaking frequency) (14). Through the general equation for strings, it can be inferred that the product of this critical frequency by the string vibrating length (in meters) is a constant K (breaking index). Such relation when expressed in other terms ( ) allow to quickly calculate the theoretical upper limit at which the cantino of each historical instruments examined will break. ic weight and the working tension. 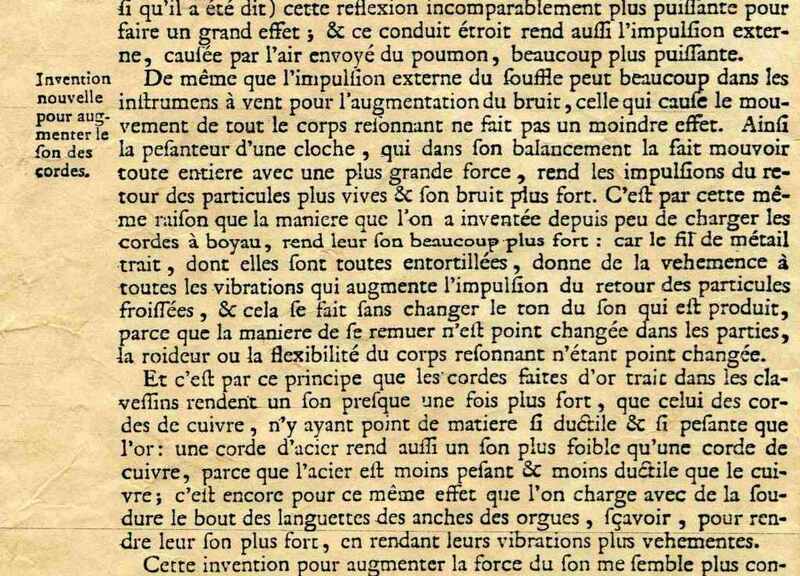 Thus is sufficient to know the bridge hole diameter to obtain what is necessary, and is no more a possible source of doubts the possibility that in the past some bridges of the historic instruments observed could have been moved in a new position, different from the original one. 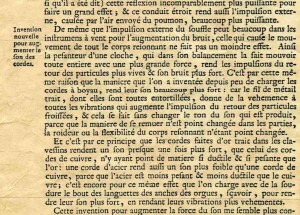 Further details can be noticed, such as that they are perfectly smooth (on the bass viol’s 6th string it is possible to see light been reflected), while the apparent increase in diameter does not follow the progression one would expect at all in a situation of equal working tension if gut strings of equal density were used. 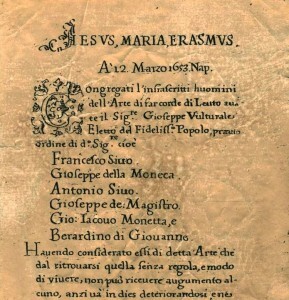 The violin also shows some very interesting aspects: while the first two strings are a light colour, the 3rd and 4th are a dark colour similar to those of the above described viola da gamba, bringing to mind J. Talbot’s writing in the early 18th century:“…best strings are Roman 1st & 2nd of Venice catlins: 3rd & 4th best be finest & smoothest Lyons, all 4 differ in size…”. Lyons, as known, were a renowned type of low register strings then available on the market. A confirmation of that anonymous painter’s colour fidelity comes from the cittern, whose strings, again in accordance with J. Talbot, are a dirty yellow (brass) while the two top courses are grey (steel). 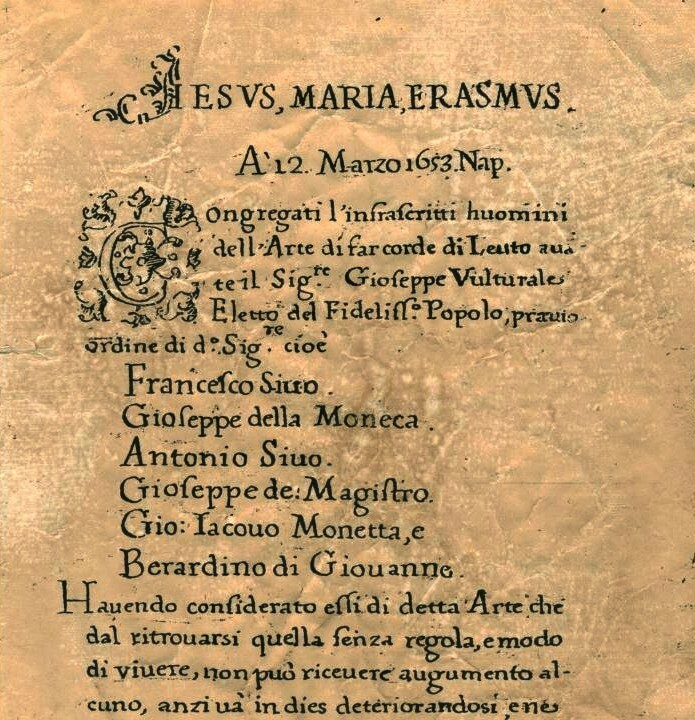 Another example like this can be found in the wonderful painting Concerto in casa Lazzari (second half of the seventeenth century?) by Girolamo Martinelli located in Carpi (Italy). 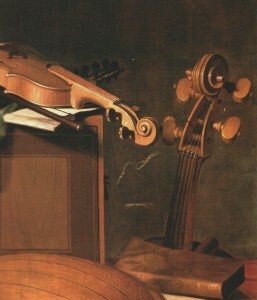 In this painting, Martinelli depicts the violone’s third thorough sixth strings in a deep brown colour and the higher two strings in white. On thebass-violin depiced in the same painting, the bottom two basses are again brown, as in the violone, with the top two strings very light in colour and the second string nearly so. 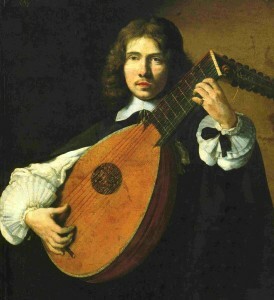 east as far as the lute is concerned, by the use of octave strings. It was however perfectly coherent with the “personality” of the higher untreated gut strings, achieving a natural extension towards the bass, unlike what unfortunately happens with overspun strings, which from the very outset suffered from serious tonal dishomogeneity (35). d tunings”, F.O.M.R.H.I. Bull nº 16, comm. 215, July 1979.